After picking up a couple of Motorola Moto G phones on the weekend I set about looking for a couple of different covers for them so as to not destroy yet another phone. The good guys over at MozileZap set over a couple of cases to review. 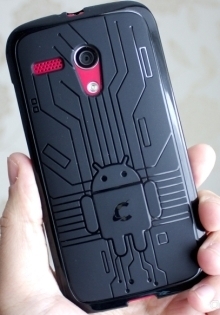 The first up is the Cruzerlite Bugdroid case. Looks great, made of a hard rubber so its strong and will bounce if needed. Nice and thick material. Doesn’t feel cheap or slippery. Personally I like the cutouts for the power and volume rocker, other cases wrap over the buttons affecting their use. The thickness of the hard rubber (TPU) used in this case may put off those looking for slim cases. The fit isnt as tight as the Grip Shell and there is some minor flex on the edges. If you’re after a case that protect your phone from a drop onto concrete and don’t might it being slightly chunky. This is the one for you.